Today has been a feel good day. It's still chilly outside, but the sun has been bright and lighting corners of my world that I nearly forgot existed. I feel downright productive. I've been wanting to make these little cakes since December, when they were first posted on Tartelette. I always find myself daydreaming about the sweet things on her site, but I've never tried any of her recipes. While browsing produce last week I found a basket of small d'Anjou pears that would be ideal for her fallen pear souffles. To give you an idea of the size, the d'Anjou variety is much smaller than the Bosc. I was still afraid they would be too big for my 4 oz. ramekins, but they worked great. The pears need to be peeled and cored from the bottom. I cored mine with a knife, which helped with getting all the little black seeds out. The pears are so small that coring and seeding is likewise a small task. A really fun part of this recipe is choosing the spices for poaching. I used the suggested cardamom, cloves and cinnamon. 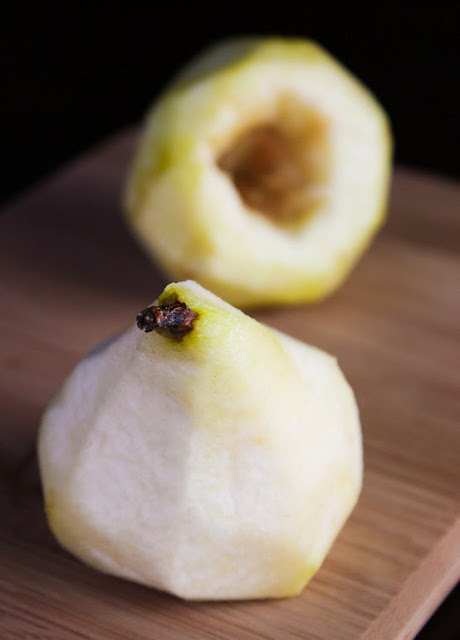 I almost poached the pears in red wine, but I've been using it in so many recipes lately. I figured I should hold off on the red wine for now, but a scarlet pear would be beautiful in this dish. All the spices go in a saucepan, along with 4 cups of water and 1/2 cup of sugar. I added some honey and anise seeds too. 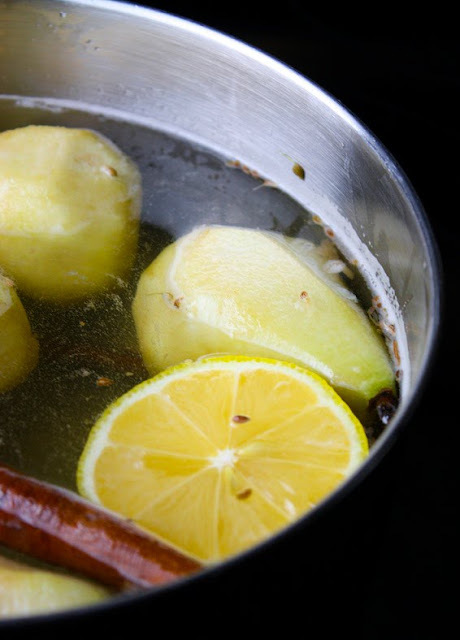 You'll boil this mixture for 20-30 minutes or until the pears soften. Mine took a while because they were a little under-ripe when I bought them. When they are done they should be drained on a paper towel or wire rack. Next you'll put the cake batter together, which is super easy and pretty basic, so I won't go into it much. You'll fill your 4 oz. ramekins 1/3 full and then plop a poached pear right in the middle. Bake and enjoy! 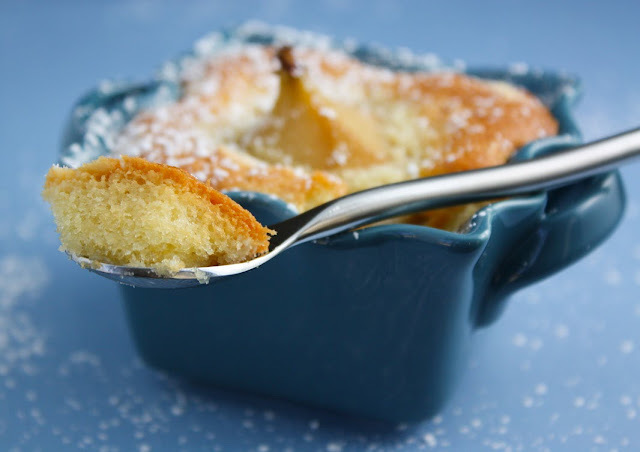 See d'Anjou Poached Pear Cakes on Key Ingredient. The cake portion of this recipe has a texture unlike any other. Tartelette describes it as part cake, part souffle, and part custard. It is indeed all three - puffy at the top, cakey around the edges and super moist and custard-like around the poached pear. Divine! I've been macaroning again. 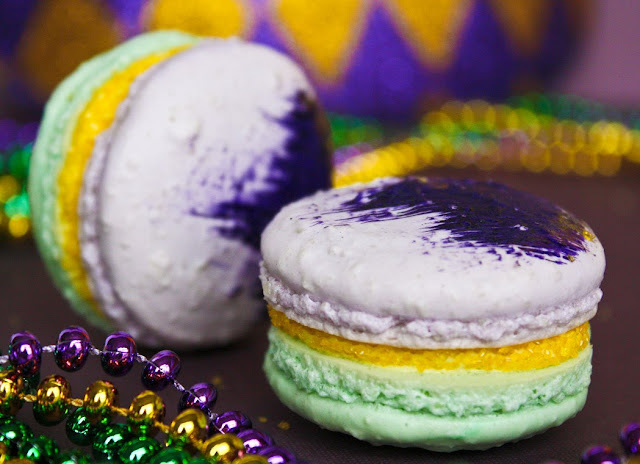 I'm just disappointed that I didn't get to post my Mardi Gras macs before Fat Tuesday. So here they are. Better late than never, right? I boxed some of these up for my parents to munch on after my mother's birthday lunch earlier this month - and guess what?! According to King's Cake tradition, I believe that means she has to make the Mardi Gras macarons next year, right? I was surprised the baby fit so well and was so well hidden! If you'd like the macaron shell recipe I use, you can find it here in an earlier post. This is my third run, and they turned nice yet again! I used buttercream for the center, and they tasted like birthday cake. I rolled the edges in gold sanding sugar. I think they turned out pretty darn festive! Now it's time to catch up with all the blogs in my reader. The number grows daily! i'm drooling! i am seriously drooling as i type this! first of all, your images make the food all that much better! 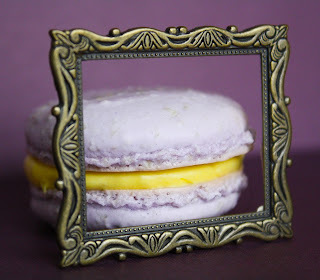 i keep seeing these beautiful little macaron creations all over the web and i want to try them, PRONTO! i love how you made yours all different colors for mardi gras, how fun! 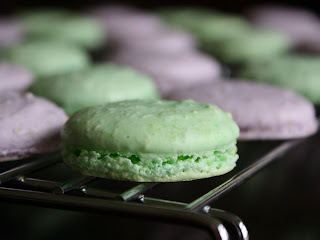 maybe i will make green macarons for st. pattys day or something! i hope they aren't too difficult to make?? The tartelette looks tasty but I love the ramekins! So unique. Where did you get them? Those pears look amazing, I always wonder what to do with pears. And your little ramekins are the cutest ever. 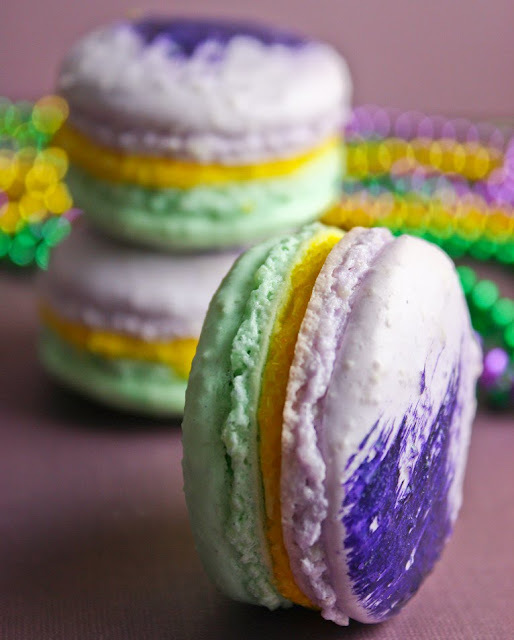 Well...maybe 2nd to those mardi gras macaroons! How clever and I bet your mom loved them!! Your cakes and macarones are pure poetry to look at.... the colors are WOW ! You are amazing!! I have never been to your blog before, it is gorgeous! I will be adding you to my RSS reader now. These recipes sound delicious and the photos are fabulous! You have a new reader in me Heather! The macarons look stunning, I have yet to make them. On one recipe it say's to bake with the oven ajar.. having kids around has deterred that. But I'm going to look for other recipes that maybe don't give those instructions. Now that poached pear almond cake.. it looks and sounds heavenly. You had me on the part cake, part souffle, and part custard description. Beautiful!! just found you through tastespotting! adding you to my rss reader! 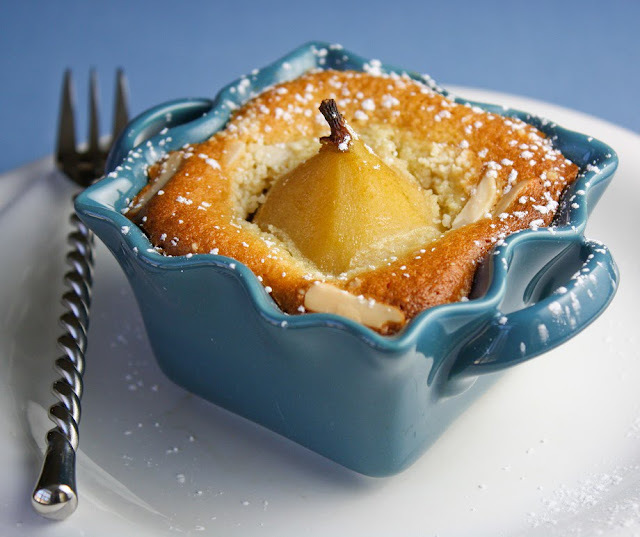 The poached pear almond cakes are almost too pretty to eat! 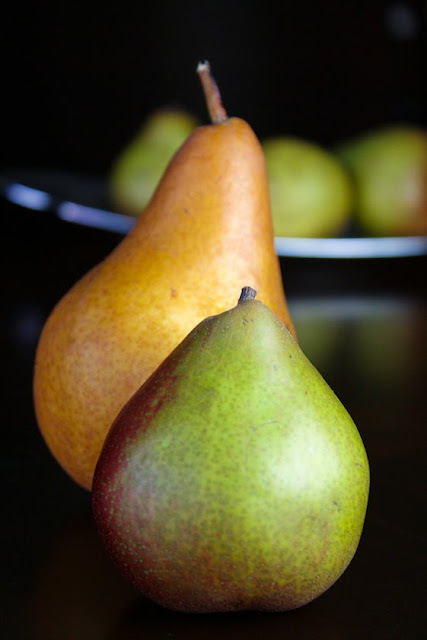 I love fresh d' anjou pears, so I can imagine how good they must be in these fabulous cakes! 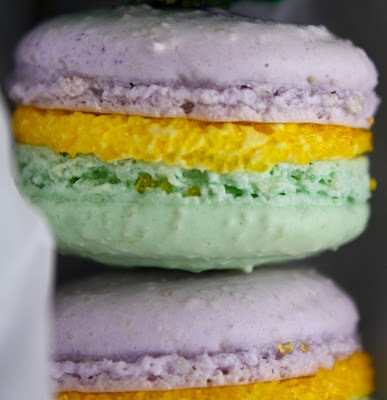 Your macarons are so pretty in Mardi Gras colors! How fitting that the Birthday Girl got the baby:) Lastly, your photos are SO wonderful...I love the little framed macaron!!! Wow... 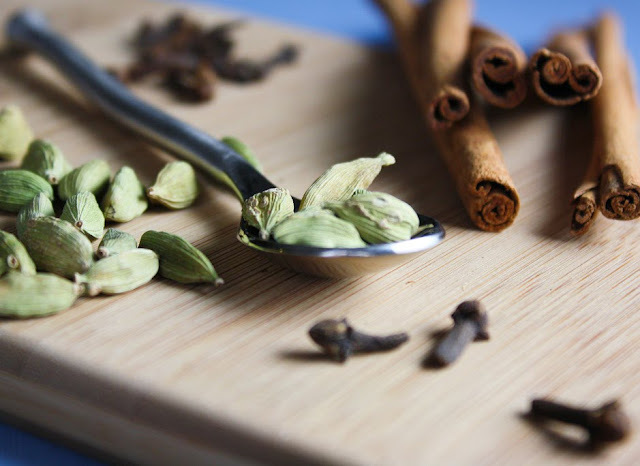 I just found your blog through foodgawker and am blown away by the gorgeous photographs! That poached pear cake looks absolutely delicious too! The pear cakes look delicious but I'm so impressed with the macarons. Actually, I'm impressed with all you do! I love that you put a baby in the cookie. I so want to get on the band wagon and make more macs. 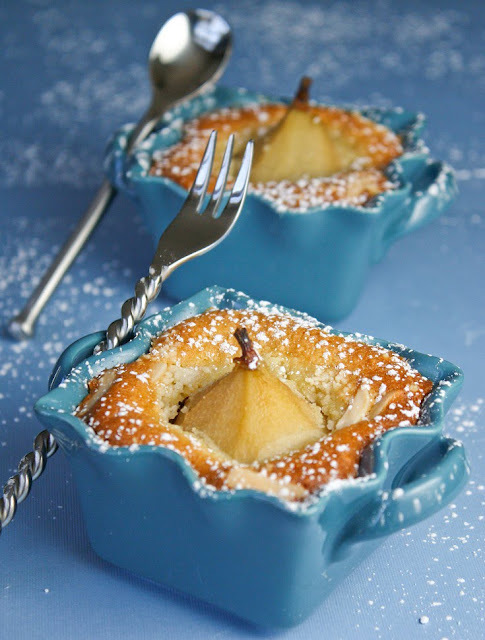 Just love those little pear cakes and that wonderful blue dish...really special and beautifully photographed! Wow, the cakes and macarons are both gorgeous! I've been admiring your blog lately - you make such pretty, tasty food! You have a wonderful blog, your photos are inspiring and very well done! I recently just started my own blog and would love to know what you think! Your pear cakes look perfect. 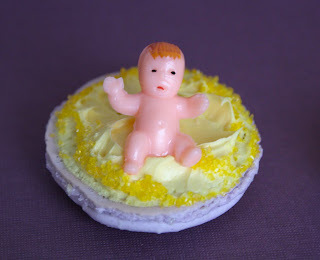 Pretty funny putting the baby in the macaron! They look great as well. Keep on inspiring all of us closet bakers...you do a great job!! Thanks for sharing! I just found your blog through your picture on Refrigerator Soup. The pictures are beautiful! I will have to try your macaron recipe since you had great success. I look forward to visiting again soon! Love the pictures, so bee-A-utiful. I'm really interested in the blue velvet cupcakes. They look cool and I'm in a cake mood lately. :) keep up the expert work! can't wait to read more!! Thanks everyone! I am currently in love with poaching fruit. I keep telling myself that fruit is good for you, even if it's in a cake or cobbler -which is only partly true. In response to Cat (hi!) - I wish I had a perfect solution for this problem! I do love to give away my sweet treats to family and friends whenever they are available to accept. Often times I halve recipes or make just enough for the hubs and I to eat once and freeze the rest. I try to prepare healthy daily meals too. I prefer vegetarian fare, but I do eat lean meats upon occasion. Still, it's a tough balancing act when blogging about so many yummy treats! I really like this recipe is so wonderful to bake, they look so different from other recipes, but I would like to prepare it as soon as I can, Also I know to my family would love it. Very delicious! As per my usual, I made substitutions w/ things I had on hand: Bartletts, halved instead of mini D'Anjous. Also Ensure (shake) in place of cream. Sprinkled on cinnamon & nutmeg before baking, too. They came out just marvelous, & relatively healthy. Yummy mid-morning snack w/ a cup of tea! Thanks! WOW!!! Now I am officially a fan of your blog! I live in New Orleans and I am so happy you made these!!! Your work is such an inspiration!!! Pears!!! Okay I am guilty! I really love your blog. Foods!! Thanks for this. My First Daring Bakers Challenge - Tiramisu!